Twachtman had painted the rural landscape of Connecticut since the mid 1880s renting property near J. Alden Weir's farm in Branchville. 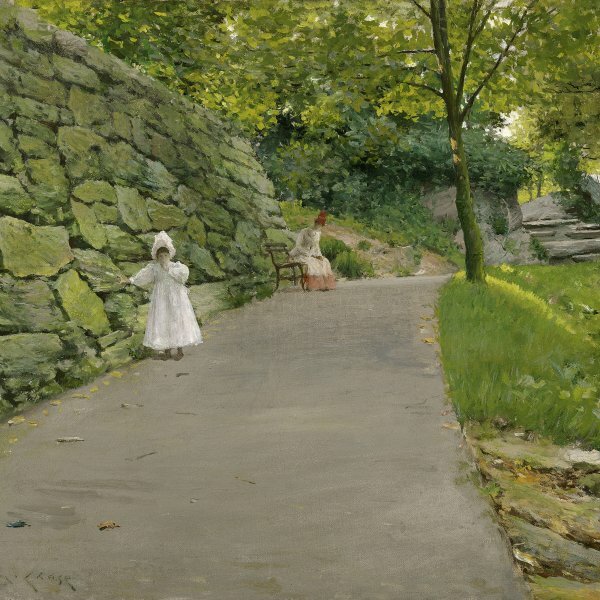 Eliot Clark relates that in the summer of 1889 a painter in Newport spoke very enthusiastically of the landscape around Greenwich: "Twachtman set out to look over the country. 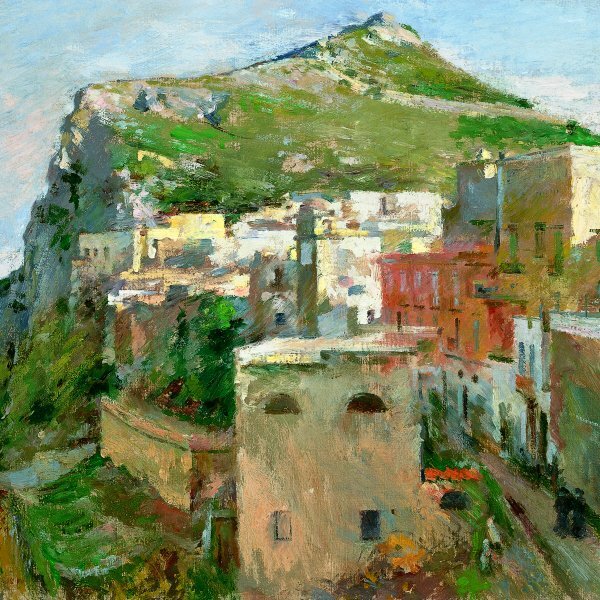 He had determined to quit paying rent, to have a place of his own, and to live in the environment which he wished to paint." Upon discovering within an area of abandoned farms the stream of Horseneck Brook and the cascade Horseneck Falls, the artist threw up his arms, and according to his son, dramatically exclaimed, "This is it!" A later article, written a few years after the artist's death, verified that Twachtman was charmed upon discovering the stream that "bent and curved and deepened into pools, and dashed itself to foam in miniature vociferous falls" and that he immediately sought to find the owner. Twachtman occupied the small farmhouse on the land as a tenant, before purchasing the house early in 1890 as he gradually acquired seventeen acres of farmland on Round Hill Road near Greenwich. "His house and property, " Lisa Peters has noted, "became his almost exclusive subject matter for the rest of his life. "Twachtman's images of the brook, falls and pool on his farmland range from more naturalistic representations to enlarged simplified visions, oriental in feeling, in which the sky is often eliminated. While these studies are similar to Monet's serial images of his gardens done through the analytical eye of Impressionism, they more closely resemble Whistler's nocturnal paintings of the Thames, which are tonal, spiritual responses to the landscape. "Twachtman painted day, " a contemporary critic observed, "as Whistler painted night." Other paintings of Horseneck Brook are End of Winter, c. 1890-1895 (Washington, D. C., Smithsonian American Art Museum); Icebound, c. 1890-1895 (Chicago, IL, The Art Institute of Chicago); Frozen Brook, 1893 (Private Collection); and Brook in Winter, c. 1893 (Boston, MA, Museum of Fine Arts). In Snow Scene, Twachtman's poetic sensibility is revealed in the delicacy of the snowy landscape. 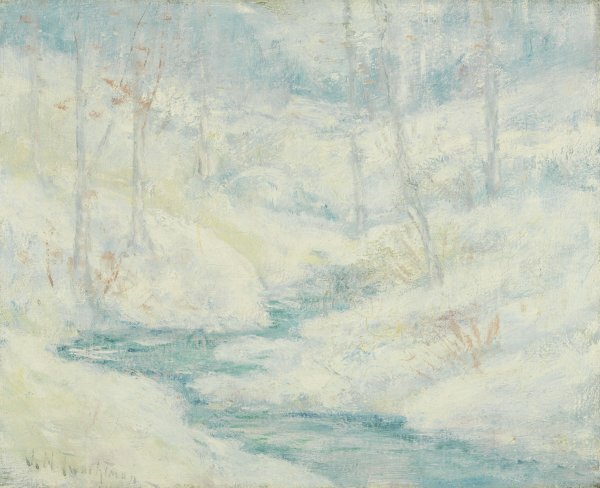 "Winter for Twachtman, " Duncan Phillips wrote, "was the magical season, for then he found ethereal enchantments in the snow, with the delicate traceries of the trees, the prismatic sunlight, the films of shadow, and that mystical atmosphere of pearl, " while Thomas Dewing felt that the close observation found in Twachtman's snow scenes "is like a page from Thoreau's note books." The artist felt a greater closeness to nature as he resided in isolation on his farmland in Connecticut and saw how necessary it was "to live always in the country-at all seasons of the year. We must have snow and lots of it. Never is nature more lovely than when it is snowing. Everything is so quiet and the whole earth seems wrapped in a mantle. That feeling of quiet and all nature is hushed to silence." In Snow Scene Twachtman was able to capture perfectly the transient, crystalline beauty of a meandering stream flowing through a snow-filled landscape in which few a warm tones hint at the preceding autumn.